What are SEM and SEO and do I need them? In the screenshot below is a results page from a Google search, often referred to in the industry as a SERP (Search Engine Results Page). 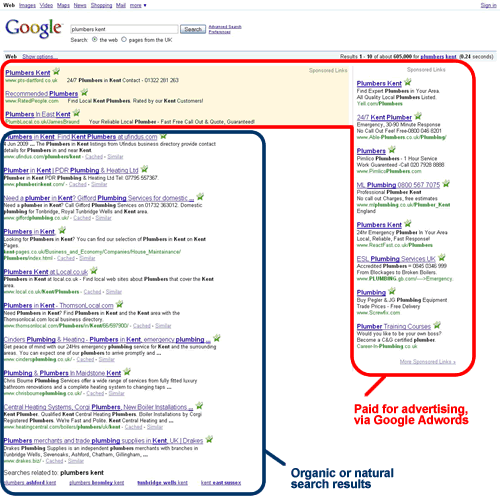 The blue highlighted region indicates the “natural” or “organic” search results, whereas the red highlighted area refers to the sponsored adverts. PPC stands for Pay per click, which is another name for the sponsored adverts which appear on the search results page. As the term suggests you pay only when a user clicks on your advert. To get your website featured in the sponsored adverts region, you will need to sign-up for Google Adwords and start a PPC campaign. In as little as 15 minutes your adverts will go live on Google and you will start attracting visitors to your website! To get your website featured in the organic listings Google will need to find your website and index it in its database. Your website’s ranking in a search engine will be based on many factors too complicated to cover here, but in order to improve your organic ranking it helps to have a search engine friendly or optimised website and promote your website using recognised SEO techniques. SEO refers to Search Engine Optimisation the activities carried out to generate qualified traffic to a website in order to appear in the “organic” or “natural” results. The term SEM refers to Search Engine Marketing and is used to describe all the activities that encompass the promotion of a website using search engines. SEM can mean either SEO and PPC combined or one or the other.